PHOTO: Eileen Barroso H.F. “Gerry” Lenfest ’58L, the benefactor who has done more than any other to build the faculty teaching in Columbia College, received the 2011 Alexander Hamilton Medal on November 17 at a black-tie dinner in Low Rotunda. The medal is awarded annually by the Columbia College Alumni Association for distinguished service to the College and accomplishment in any field of endeavor and is the College’s highest honor. A highlight of the dinner was the announcement by President Lee C. Bollinger that Lenfest and his wife, Marguerite, have pledged $30 million to help build a multidisciplinary arts venue on the Manhattanville campus. It is the largest gift ever made for the arts at Columbia. James J. Valentini, interim dean of the College and vice president of undergraduate education, likened Lenfest and the impact of his philanthropy to 19th-century English scientist Michael Faraday, “who had more things in science named after him than any other person,” including the Farady Effect. Valentini noted that the theme of the dinner was the celebration of the wide-reaching “Lenfest Effect” on Columbia, its faculty and its students. “Gerry’s legacy, like that of Michael Faraday, will continue for all time,” Valentini said. “I’m deeply honored to receive the Alexander Hamilton medal,” Lenfest told the alumni, faculty, students and guests who filled Low Rotunda. “Although I did not attend Columbia College, I value greatly a liberal arts education, and that is the motivation for my gift to Columbia and the arts announced tonight.” In his remarks, Lenfest noted the connection between the arts and the Core Curriculum and read from letters he had solicited from alumni on the impact the Core had on their lives. Lenfest’s giving is remarkable for both its scale and enormous range. His $37.5 million Arts and Sciences match pledge, made in 2006 to match gifts for endowed faculty chairs in the Arts and Sciences, inspired other donors to create 25 new endowed professorships. 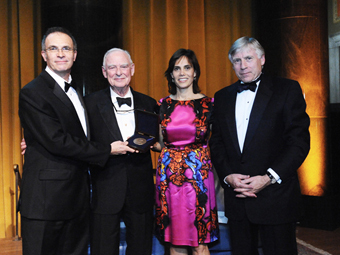 The Distinguished Columbia Faculty Awards, established by Lenfest in 2005, also build this faculty by recognizing those who excel not only in research but also in the instruction and mentoring of undergraduate and graduate students. So far 53 faculty members have received the honor. Also in 2006 Lenfest pledged $10.5 million to match endowed professorships at the Law School. He has given extensively in support of the Lenfest Hall residence and other Law School projects and programs. His broad interests encompass promoting sustainable development and advanced solutions to global climate change and acute global poverty, including support for the Lenfest Center for Sustainable Energy, the Gary C. Comer Geochemistry Building at Lamont Doherty and other Earth Institute initiatives. Lenfest continues to support the College and earlier this fall established, together with Board of Visitors Chair and University Trustee Jonathan S. Lavine ’88, a matching fund to endow five assistant professorships in the Core Curriculum. His commitments to the Campbell Sports Center and the Columbia University Libraries promise to have direct impact for students. Lenfest’s long record of giving also includes support for financial aid at P&S, various initiatives at Nursing, Miller Theatre and more, and he chairs the University’s 1754 Society, an association of all who have named Columbia in their estates. A University Trustee since 2001, Lenfest was presented with the Honorary Doctor of Laws from the University in 2009. A graduate of Washington and Lee, Lenfest practiced law at the New York firm of Davis Polk & Wardwell before becoming corporate counsel of Walter Annenberg’s Triangle Publications in 1965. In 1970 he was made managing director of the company’s communications division, then consisting of Seventeen magazine and Triangle’s cable television properties. In 1974 he started Lenfest Communications with the purchase of two cable television companies from Annenberg. In 2000, the company, with more than 1.2 million subscribing homes, was sold to COMCAST Corp. In addition, Lenfest serves or has served on the boards and councils of many nonprofit organizations, including the Philadelphia Museum of Art, where he serves as chairman of the board of trustees, chairman of the James Madison Council of the Library of Congress and chairman of the board of trustees of the Curtis Institute of Music. He is a past trustee of Washington and Lee and past president of the board of Mercersburg Academy.